Our garden decking boards are of exceptionally strong quality; measuring 150mm wide by 35mm thick, pressure treated pine, smooth on one side and ribbed on the other. 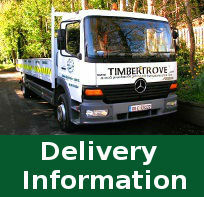 The lengths of timber decking boards we carry are 4.8m and 5.4m, depending on our stocks. A complete range of accessories are available from Timbertrove including joists, handrails, screws,membrane and sealants. If you require sleepers to be removed, these can be cut by our team for an extra charge. We offer a full supply and fit service. Please contact our sales office on 01-493 1034 for details.